Many people see going vegan as giving up certain foods. While that may be strictly true in that animal products of any kind are most definitely off the table, other foods sneak their way into your diet and you’re all the richer for it. What do I mean? Well, there are many foods I eat now that I wouldn’t have eaten before I became vegan. The only reason for this was that I simply didn’t think about eating creatively. Even as a vegetarian, which I’ve been for most of my life, I didn’t consider the wide spectrum of food available to me. It’s funny, even going veggie aged twelve, people asked me (as indeed they do now) ‘What do you eat?’ as though all they do all day is stuff meat into their faces. Come to think of it, maybe that’s not so far fetched…Anyway, what I’m saying is that far from sacrificing flavour for your principles or health, as a vegan you tend to discover a whole new range of tastes that more than make up for any you’ve had to give up. If you’ve even flicked through a vegan cookbook you may have thought to yourself, what on earth do these people use as ingredients – weirdos. Well, although I’m discovering new food all the time, I’d like to give you a rundown of some unusual vegan ingredients that you may not have heard of, as well as more familiar ones that we vegans use in non-traditional ways. I’m going to kick off with Nutritional Yeast, or nooch for short. It’s a savoury, almost cheesy tasting non-active yeast that comes in the form of flakes and you can buy it at your local health food store or online. You can use it for all sorts of things, but I like to sprinkle it onto a pasta dish for some extra B12 (some nooch is fortified with it) or spin it into a homemade salad dressing to round out the flavour. There are various recipes for blending nooch with flour, water, mustard and cashews or suchlike to make cheese-style sauces. This is one of the best from vegan chef Isa Chandra Moscowitz. I also love the one from her cookery book Appetite for Reduction, although she has several others on her website, check them out. I also love to stir nutritional yeast into a risotto at the end instead of parmesan (although vegan parmesan is coming on in leaps and bounds.) See my recipe here. So really, it’s a flexible ingredient that’s great when you’re after that cheesy taste. A little goes a long way, so my advice is to buy yourself a tub and search around for some fun recipes or simply experiment yourself. We were ushered into Ushas (sorry…), the only all vegetarian Indian restaurant in Glasgow, early on a Saturday evening. We’d booked a table for four (One vegetarian, one vegan (me) and two non-veggies.) Shown to a cute little booth in the window, we settled in, but soon found that it was a bit too little to accommodate our ample frames, so we were shown to a more suitable table in the middle of the restaurant. From here we could appreciate the decor more fully and stretch our legs. 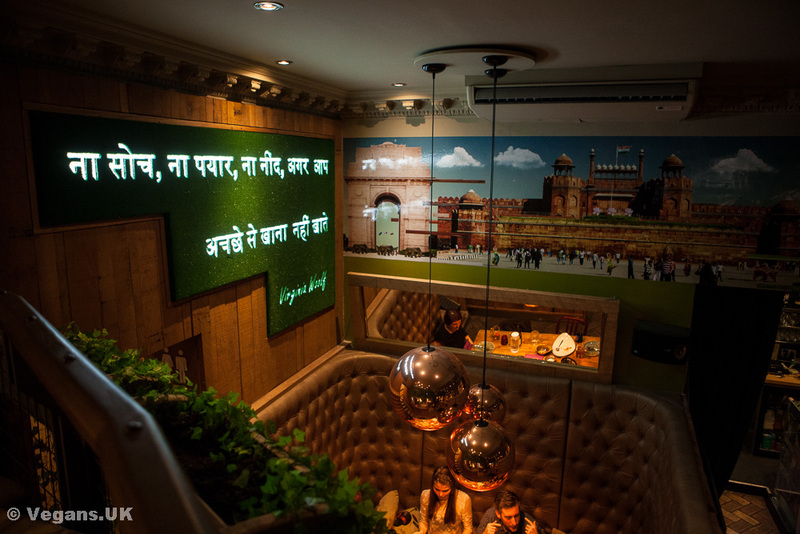 There’s been amazing attention to detail, from the silent Bollywood movie playing on a loop, to the Hindi writing on the wall to greenery and lights to delight all around. This cosy yet stylish place has only been open for five months at the time of writing (Nov 2014) but is already making its mark. Of the many items on the menu, only a handful were not suitable for vegans, and of those which weren’t, some had a vegan option available. Luxury! I didn’t realise I was so indecisive until I’d been faced with such choice. I had to have a bottle of Cobra while I thought about things…(They also do a very palatable non-alcoholic version for the designated driver.) Incidentally, if you have any celiac friends (as I do) they will be overjoyed with the options too – there’s loads for the wheat intolerant, which is brilliant. As well as a fully comprehensive menu, you can also choose a spice level, which is great for groups. We just went for medium with everything, which gave a nice kick to the meal but didn’t have you reaching for the iced water. went down very well indeed. We chose to share most of our dishes around, but as is the case in Indian restaurants generally, we over-ordered big time. Still, at least we got a taste of almost everything! Dhosas are a favourite of mine, delicate rice crepes with assorted fillings, but a new discovery was Uttapam, a lentil pancake. I had mine with roast Indian vegetables and all of us loved it. It’s served with a wide array of chutneys and there were actual exclamations of ‘ooh, yum!’ so I think the Uttapam goes down as the favourite of the evening. We had a selection of curries to follow with garlic mushroom pilau rice and Zanzibar pilau (coconut and raisin) with Aloo paratha which is a speciality Indian bread. It makes a nice alternative to Naan, although the plain naan on the menu is vegan, which makes a refreshing change as in most Indian restaurants, I often ask and they say the naan is made with milk. To be honest, after all that, we were absolutely stuffed, and so when the waitress came with the dessert menu we just laughed. None of the desserts are marked as vegan on the menu, but I’m sure they’d come up with something if you asked. They suggested we take a doggie bag with the leftovers and we gratefully accepted. They were packaged up promptly and expertly. The staff here are friendly and attentive and we never felt rushed, even though it was a Saturday night. All in all it was a very enjoyable dining experience. And as a bonus, we had the surplus for tea the next night. Nice. Really good value for a fun night out. 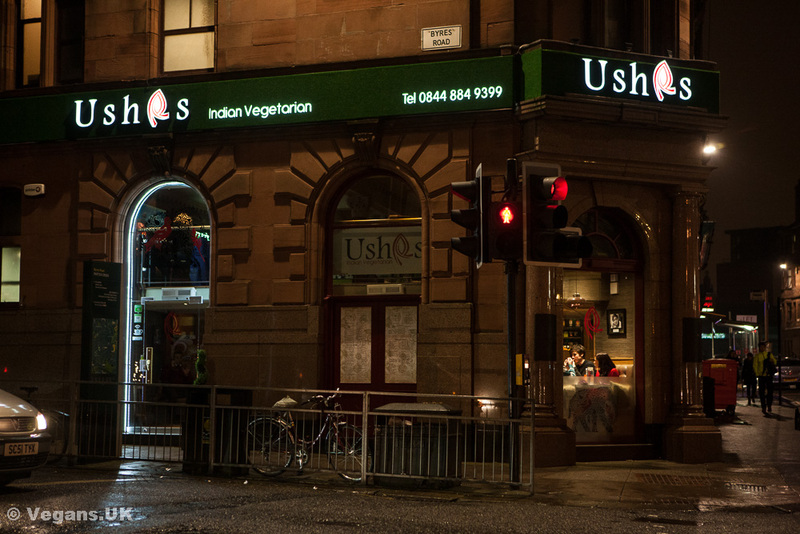 Ushas is at 2 Byres Road, Glasgow – a city which has been voted the most vegan-friendly in the UK! Feel free to add your own review for Ushas Glasgow on the restaurants page: Ushas Glasgow Reviews.